Chest and back pad compartments (CE-certified Nucleon chest and back protector inserts available as accessory) for use if Tech-Air Tech-Air® is not installed. The garment is designed with stretch gussets on the arm and sleeves to accommodate the jacket’s inflated volume without compromising seam strength or material integrity. The jacket’s ergonomic design means that it can be worn without the airbag system for a versatile, personalized fit. These jackets are sold in US based “alpha” sizes, so selecting a size is basically pretty easy. For most people, you would choose the size you normally wear in men’s clothing. Alpinestars publishes a super-complicated size chart which can be used to pick a size based upon your chest and waist. We’ve condensed their chart down to make it easy to read (see below). The waist is adjustable with Velcro tabs. Overall this should be a very easy style to fit. The max waist of a jacket style like this is only a couple inches smaller than the max chest, so the style is very forgiving in case you have a bit of a belly, but don’t be concerned if your belly is smaller than the size listed below because this jacket has some very effective side waist adjustment straps. About sizing when accessory armor is used: I’d recommend you add 1” to your chest and belly measurements if you plan on adding the chest pads and the KR-1i back pad, which will be most peoples upgrade choice. If you want to add the KR-2I back pad, add 2”. The Tech-Air airbag system can be used with this jacket and would be used in place of the back pad and chest protectors. If selecting the air bag system, add 2” to your chest and belly measurements before selecting your jacket size. 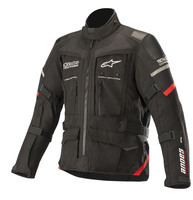 The Alpinestars Andes Pro Drystar jacket is a VERY high tech product with many armor capabilities and options. Its packaged in a very nicely styled 3/4 length textile style for street, touring or adventure riding. The direct venting along with full waterproofing makes this jacket all-season. Drystar is a brand name waterproof liner used in MANY Alpinestars jackets. Its a competitor of GoreTex and the idea is to provide waterproofing which allowing your body moisture to escape so you stay dry and comfortable. In this jacket, the Drystar liner is installed between the jacket’s outer shell and inner liner to prevent water from entering the jacket when it rains. in most jackets with a permanently installed waterproof liner, the venting is restricted by the liner, but in this jacket, the venting is set up to be “direct vent”. On the chest there are two large zip-down panels. The zippers on those panels are waterproof, so when they are closed, water is kept from coming through, but when open, there is a mesh panel exposed to the wind blast that allows air to flow right through the jacket to your body. Compared to standard zippered venting, these panels are HUGE and should flow many more times the air than if you had just zip venting. The vent panels are fitted with a couple snaps so you can configure the vent to be half open, or full open. When full open, you will be tucking the panel down into a pouch built in below the panel so you won’t have to figure out where to store them (or lose them). There are also “two way” zippers on the sleeve ends. you can zip those down from the top to allow air to flow through and up your sleeve. Those vents are not direct vent (the air flows over the WP liner, but still there is a good effect. On the back side of the torso are a pair of zippered exhaust vents to allow air to escape the jacket. With this new style, you get the “full meal deal” with regard to armor options. Firstly, you get CE-certified level 1 shoulders and elbow protectors. This jacket also includes chest and back protection capability. There are two chest pad compartments in front and the traditional back pad compartment. You can add chest and back protectors (see the links below). Most will opt for the level one back pad although there is a level 2 back pad available as well. We’ve got good descriptions of both, so just click through the links to consider those options. The shoulders and elbows of this jacket have extra external overlays of a rubberized material to beef up the abrasion resistance in those areas (the shiny rubberized patches you can see in the pictures). As if that weren’t enough, this jacket is compatible with Alpinestars Tech-Air® street air bag system which is an optional air bag vest that is worn under the jacket and replaces the the optional armor mentioned above. See bulleted description above. MORE ON THIS OPTION LATER. Alpinestars says: Designed using Alpinestars exclusive DRYSTAR® construction, the Andes Pro DRYSTAR® Jacket offers true versatility with 100% waterproofing and great levels of breathability, even in difficult riding conditions. The technically advanced construction of this jacket offers protection and abrasion resistance and is adaptable to all weather conditions. The Andes Pro is also compatible with Alpinestars leading active airbag protection system, Tech-Air®.